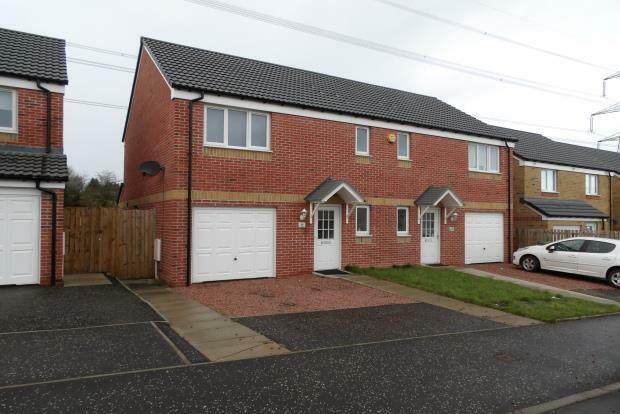 3 Bedroom Semi Detached House To Rent in Glasgow for £1,075 per Calendar Month. Craigswood Way sits in a beautifully quiet modern development with the best of both worlds. The home benefits from an abundance of great local amenities and transport links with around a 15 -20 minute journey time to the city centre. Edinburgh Road is just around the corner with frequent buses to the city, Easterhouse and Ballieston train station is a short distance away with plenty of trains and the M8 motorway is a couple of minutes away with greater access to the rest of the country. Baillieston itself has a large Morrisons supermarket along with the many cafes, restaurants, pubs and shops that you might expect from one of these communities. A nearby convenience store is handy for those last minute bits and pieces, however for a more varied shopping experience the vast Fort retail park isn't far away for a huge variety of retail outlets and eateries. This home has fantastic kerb appeal with an attractive modern light brick finish, driveway and single garage. Enter this brand new home and you are met with a well laid out lounge, beautifully decorated with neutral tones throughout. Next door the modern kitchen is fully equipped with all mod cons and a gas hob with electric oven. Ample storage and work space gives plenty of room. Tiled splash areas and floors make cleaning up easy. The downstairs WC with plenty of room for your bits and bobs. Upstairs are three carpeted double bedrooms, master with built in wardrobes and ensuite bathroom. Across the landing is the family bathroom with immaculate three piece suite with tiled splash backs and shower attachment. The garden is vast and has an added bonus of looking out to the green space at the rear of the home. Avoid disappointment; call us today to ensure you get your new home ready for Summer.